JT Eaton Kills Bed Bugs Plus is the latest spray by JT Eaton offering up to a 12 week residual in a convenient aerosol form. It's non-staining water-based formulation can be applied to sofas, chairs, mattresses, curtains and carpeting (always read and follow the product's label). 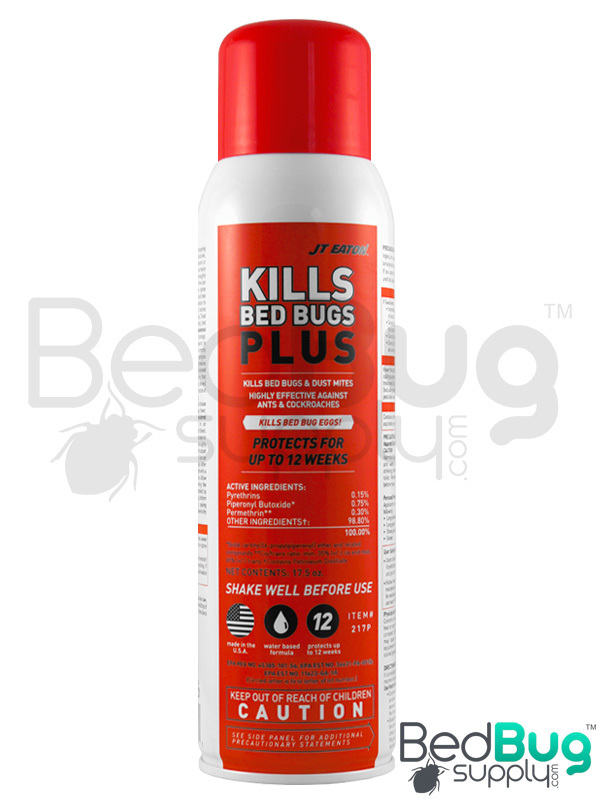 JT Eaton Kills Bed Bugs Plus, in easy to use aerosol form and smart cap technology, is the newest formulation among professional strength bed bug sprays ensuring that no bed bugs including the difficult Cincinnati, New Jersey and New York strains will be resistant. This along with an industry leading 12 week residual killing ability and a full mattress and carpet broadcast label, make Eaton Kills Bed Bugs Plus one of the most versatile and effective sprays on the market. JT Eaton, the makers of Kills Bed Bugs Plus, was one of the first to create a line of bed bug specific sprays and powders back in 2007 harnessing years of experience dating back to their inception in 1932. JT Eaton Kills Bed Bugs Plus is a water-based aerosol spray that will not stain most water safe items including curtains, sofas, chairs, carpet etc. Although subjective, the smell of the product is quite neutral compared to other sprays we have tested. Its important to always read and follow the products label to ensure safe and effective usage including allowing the product to fully dry before allowing people and pets back into the treated room. 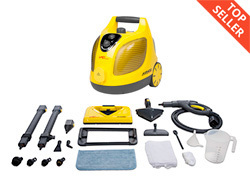 The other compelling feature of Kills Bed Bugs Plus is the price. The product is a great value at just $14.95 per can including 3 premium professional strength active ingredients in one can (Pyrethrins, Piperonyl Butoxide and Permethrin). Working together, these 3 ingredients kill bed bugs after application for up to 12 weeks (longer than any other bed bug spray on the market) Most comparable professional aerosols cost considerably more between $16-$20 per can, which is why many of our existing customers are switching to Kills Bed Bugs Plus. There are only a few true residual bed bug sprays on the market due to many strands of resistant bed bugs out there, but JT Eaton has met the challenge with their new Kills Bed Bugs Plus spray. In a convenience Aerosol form, it is easy to apply and is economical in price compared to other leading brands. JT Eaton was one of the first companies to meet the bed bug epidemic head on with their Kills Bed Bugs line of products, which have been very effective in eliminating bed bug infestations. This new tool now offers a greater residual killing ability than every before. JT Eaton Bed Bugs Plus Kills Bed Bugs Plus kills bed bugs and dust mites. JT Eaton Plus combines Pyrethrin and Piperonyl Butoxide with a water based formula for a fast knockdown and effective kill of bed bugs. It is also highly effective against ants and cockroaches. It continues to protect for up to 12 weeks. Due to this long residual effect, JT Eaton Plus is able to kill bed bug eggs as well. JT Eaton Bed Bugs Plus- Knockdowns Resistant Bed Bugs As an industry standard, JT Eaton Bed Bugs Plus achieves outstanding results against insecticide resistant bed bugs. It acheived 98% kill after 24 hour study. Q: I have three cats in my apartment and I would like to use this product in my bedroom, specifically for baseboards my curtains and my bed of course, how long do you recommend I wait until the cats can come back inside the room? Or is it even safe to have them in the apartment when I do this seeing as the product stays for several weeks. Do you even recommend a different product for me? And do you ship to Ontario, Canada? The product is safe as long as it's fully dry before the cats re-enter the treated rooms. It's hard to say how long this would take given variables in temperature and humidity. My best guess would be 6-8 hours. Be sure to apply only in cracks and crevices, which will not come into contact with your cats or your skin. We do not currently ship this product to Canada due to customs related issues. While spraying and shortly after, there is a mild and inoffensive odor. That odor will fade away after the spray has time to dry. Q: Does this leave an oily residue? I have used one of the other products on suitcases and it ruined them. Looking for something to spray on luggage before a trip that will not ruin it. This product won't leave an oily residue, but it's also not labeled for use on luggage. Make sure to only apply insecticides as the label permits. We used this product 2 weeks ago along with a steamers interceptors and covers and haven't been bitten since. The spray is easy to use and doesn't stink up the house. It's very good and I recommend it. Reviewed by: Max from New York, NY. Reviewed by: johnie grasty from atlantic city. SO FAR,SO GOOD WE'LL SEE!! Reviewed by: RON A TAYLOR from BRONX. I started using this spray several weeks ago and it works as advertised. The smell is not very strong and dissipates quickly. Recommended. Reviewed by: sharon from Pittsburgh. It has been 10 days since I sprayed. So far, I have not experienced any bed bugs activity. I will order more spray though so I will have it if any bed bugs show up. The odor of the spray is mild and goes away quickly. I don't like the way the aerosol cans get drippy and the chemicals get on my hand. That however is minimal as long as the bed bugs are eradicated. Reviewed by: James Brancaccio from 421 N. Limestone Lexington KY. Bed bugs seem to be more resilient than a cockroach, but this spray seems to be one of the best things out there. 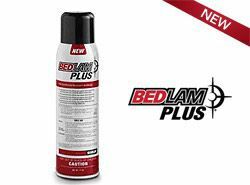 We are doing this battle by battle (dealing with bed bugs in an old house is difficult, because you don't 'really' know where they are), and this spray is the main thing in each battle. We noticed a significant decline once we started using this product, and will continue to use it as we do our bi-weekly spray to make sure they don't come back. Highly recommended. Reviewed by: Jeremy Lindsey from Elgin, IL. Reviewed by: Gilbert Jefferson from phila, pa. Reviewed by: William Norfleet from Virginia. I like the way this product foams. 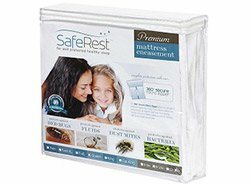 I did not see any bed bugs for three days after applying this product to cracks and crevices. However on day four the bed bugs returned. I was very disappointed but decided to give it time since this product is a residual. I was right, I'm starting to see a dead bugs now. Reviewed by: lewis carpenter from palm harbor fl.